Meet Christina Agos, an active member of the WNYBAC Board of Directors and one of our consignment artists. She has been involved with WNYBAC for about 5 years now. 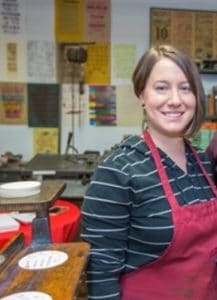 She said, “It started with an interest in browsing the store and taking workshops, and it grew into a love for the preservation of the book arts and also for the organization and their mission.” She started volunteering to be more involved with Book Arts and steadily made her way to the position she holds now. 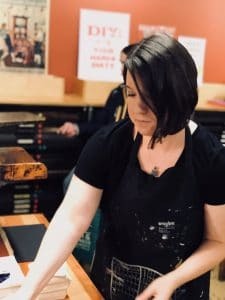 Christina’s craft is letterpress printing, which she actually learned taking workshops with us when she was making invitations for her wedding. She enjoyed it so much that she bought Millie, her platen press, and turned part of her basement into a studio space. She found a way to connect it with her knowledge in Graphic Design. “ I enjoy combining old and new technology by designing on the computer and then printing that design by hand. 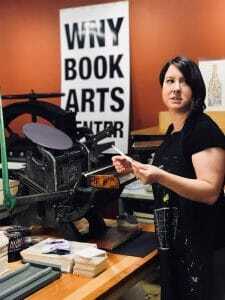 Christina describes herself as a “Mompreneur” and she wants to make her letterpress craft a full-time commitment. She has reached a point in her life where she is not afraid to learn new things and meet new people. She said she is glad she pushed herself to learn about WNYBAC instead of just being to afraid to put herself out there. Posted on March 24, 2019 by Rosemary Williams.